No other sport challenges will challenge your child to move the ball with his/her feet at speed. Only HappyFeet program develops the advanced coordination needed to perform the most difficult soccer skills under pressure. 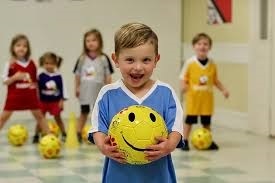 Your child will have his/her own ball for 100% of every class. He/she will enjoy an incredible number of touches and an early familiarity and mastery of the ball unheard of at the younger age. The HappyFeet goal is that each and every kid has fun, improves their fitness, increases their enjoyment of fitness activities, achieves a higher self concept and gains advance skill! HappyFeet curriculum benefits both boys and girls in its goals and through its approach.